Mergers and acquisitions among key players in the larger oil and gas sector is a key growth trend prevalent in the global industrial gas regulator market. This is not only aiding key players expand their operations, but is shaping the industry to have a consolidated vendor landscape. Further, key players are pouring money into innovation and advancement of existing products for competitive gains. These newer products are likely to overcome the drawbacks of predecessor products that are subject to strict regulations for safety reasons, which will work in favor of the industrial gas regulator market. The primary factor driving the global industrial gas regulator market is the growing demand for industrial gases for power generation and for the operating of industrial units. Several governments around the world are promoting the use of natural gas in place of conventional fossil fuel to curb CO2 emissions. As per estimates presented by a report by Transparency Market Research, the global industrial gas regulator market will expand at a CAGR of 3.11% for the forecast period between 2017 and 2025, for the market to be evaluated at US$18,240 mn by the end of 2025. The market stood at a valuation of US$13,783.7 mn in 2016. The report studies the global industrial gas regulator market on the basis of application, gas type, regulator type, and region. In terms of application, the report segments the global industrial gas regulators market into oil and gas, steel and metal processing, chemicals, pharmaceuticals, food and beverages, and others. Amongst all, the segment of oil and gas is anticipated to display the leading CAGR of 3.17% over the forecast period between 2017 and 2025 and is projected to account for the leading revenue contribution by the end of 2025 end. Volume-wise, the oil and gas segment held the leading 43.5% market share in 2016, and is anticipated to expand at a significant 4.86% CAGR between 2017 and 2025. On the basis of regulator type, the segments of this market are single stage and dual stage. Vis-à-vis volume, the segment of dual stage industrial regulator is likely to hold 31.8% market share until the end of the forecast period in 2025. This is mainly because of ease of operating dual stage regulators. Based on gas type, the market has been divided into inert, toxic, and corrosive. In 2016, inert segment accounted for the leading revenue contribution on the back of ever-increasing demand for inert gas across industries. The inert segment is expected to rise at the leading 3.28% CAGR for the 2017-2025 forecast period. In terms of geography, the report studies the global industrial gas regulator market across North America, Asia Pacific, Europe, South America, and the Middle East & Africa. In 2016, North America stood as the leading revenue generating region followed by Europe. In the years ahead too, these regions are expected to maintain their dominant positions. However, Asia Pacific is expected to display the leading CAGR between 2017 and 2025 on account of the rising demand for natural gas for power generation and industrial units. The growth in the region is largely driven by massive production and consumption of acetylene gas in China. The South America industrial gas regulators market will expand at a meagre 2.2% CAGR between 2017 and 2025. Key participants in the gas equipment sector are engaged in developing innovative products and are showcasing them at industry events. Emerson Electric Co., GCE Group, Honeywell Process Solutions, Air Products and Chemicals Inc., Rotarex S.A., Air Liquide S.A., Praxair Technology Inc., The Linde Group, and Cavagna Group S.p.A are the leading companies that operate in the global industrial gas regulator market. 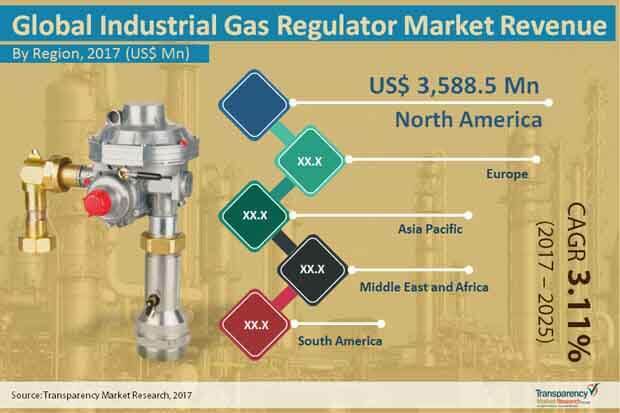 The study provides a holistic perspective on global industrial gas regulator market growth in terms of revenue estimates (in US$ Mn) and volume (in Mn Units) globally. The market estimates have been analyzed by taking into account the impact of various economic, political, technological, social, and legal and the existing market dynamics influencing market growth. The report would also include executive summary, providing the overview of the global industrial gas regulator market. The report also provides industry development and key market indicators for the global industrial gas regulator market. Furthermore, report provides market attractiveness analysis, for each segment based on their CAGR and market share. The report also provide Porter’s five forces analysis about the industry competition, market dynamics and the most profitable segments in the market. This research study on the global industrial gas regulator market provides a detailed cross segment and cross country analysis based on the different segments including gas type, regulator type and application. Based on the gas type, the market is divided into the inert, corrosive and toxic. Based on regulator type, the market is segmented into single stage and dual stage. The application segment is further classified into oil & gas, chemicals, steel & metal processing, food & beverages and others. The report also covers profiles of major players, their growth strategies and focuses on the recent developments under the competition matrix section and includes market positioning analysis of key players operating in the industrial gas regulator market. The competition matrix for key players in the global industrial gas regulator market notes their capabilities and growth potential and also benchmarks the key companies in the global industrial gas regulator market on the basis of top line growth, market share, segment growth, infrastructure capabilities, market position, product offerings, R&D focus and future outlook. Under the company profiles section, the report also includes an overview of the players operating in the market, the annual revenue generated by them in the past two or three years, SWOT analysis, regional breakdown and their relevant business segment revenue. The report also contains market share analysis of the key players in the industrial gas regulator market for the year 2016 based on their revenues generated for the same year.